Our Bahamas trip was pretty epic if you ask me. I mean, what wasn’t to love about hanging with pigs on a beach, swimming with sharks, and feeding iguanas? Of course that was only one day out of our full week there because yes, we were there for a meeting. But I’m so glad I could mark this off my bucket list! We stayed at the gorgeous, Rosewood Baha Mar, I took so many pictures of the resort because it was absolutely fabulous! Every space was designed impeccably. There were tons of restaurants on property to pick from, high end stores to shop at, and there was a casino! It was the perfect location for a work meeting. The one day we had off, Husband & I took full advantage of and flew to the Exumas. We did a 8 hour tour which took us by boat to all the spots we thought we HAD to see- Iguana Cay, Pig Beach, and Compass Cay to swim/ pet nurse sharks. After all the adventures, we stopped at the yacht club and drank plenty of painkillers (a favorite cocktail of the locals) and ate plenty of conch fritters. What a fabulous trip! Will definitely be back with the boys in a few years! 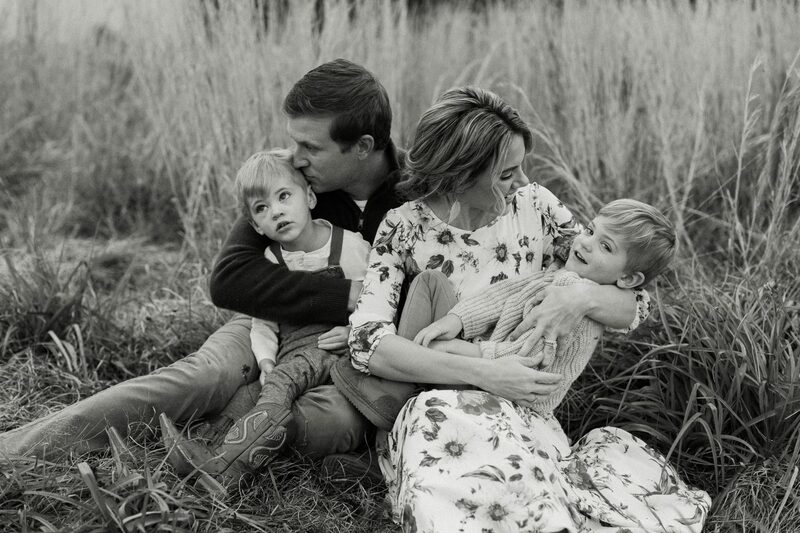 I cannot even begin to describe the feels I get when looking at this absolutely beautiful collection of images that my dear friend, Laura Gattis, captured of our family. Do you ever look at the moment within a picture and wish you could go back to the day, that minute, that exact second to relive it? That’s how this session was. It was supposed to rain… but it didn’t. Bennett was in the BEST mood of his life, and Remy didn’t mind wearing the cowboy boots I picked out, #MomWin! Oh. My. Goodness. I will cherish these pictures forever and ever. I cannot wait to scatter these in fresh frames all over my home. You don’t realize how fast life is soaring by you until you look at pictures from a week, month, year ago… I want to cherish every single smidge of time I get with my boys. For every tantrum and what seems like torturous moments, there are seriously hundreds of incredibly heart flutteringly wonderful moments. I love this little family of mine more than comprehension, and nothing will ever change that. These pictures captured about two hours of our life together, and I’m so thankful to have them to stare at later when my kids are grown and no longer hang on me for love and attention. I will remember these small moments of time with fondness, thinking about their innocence and joy, and they will bring a smile to my face every time. Has anyone been to Big Sky, Montana?!? This was a first for us and it was incredible! And cold!! The highs never got above 30 and it snowed almost every day we were there which was pretty chilly for these Floridians. The trip was dedicated to skiing with our friends, we stayed in a ski in/ ski out home that was absolutely fabulous, but unfortunately Bennett (who was allowed to start ski school because he is 3 and potty trained) did NOT enjoy it. Not surprising… it takes him a while to warm up to new things, but he didn’t even give it a second chance. I’m hoping we can do another ski trip next year and try again, that way Remy will be able to join in on the fun and hopefully encourage Bennett to try. Although, I must say, Remy HATED being cold. Every time we went out and played he cried the entire time (see solo picture above ha ha ha!). I took a lesson since I haven’t skied in over 15 years. I learned so much in that three hour private lesson than I ever did as a teenager. I feel like as adults we appreciate the time and energy it takes to do activities like skiing, so we pay attention better as to really avoid hurting ourselves ;). I didn’t want to go home with two very energetic little boys and a broken leg or hip! So, I was very attentive and felt like I got the hang of it fairly quickly. Now… I’m very slowwwwwww. This mama won’t be going down a black diamond any time soon. But, I did enjoy myself every day that I got to ski and cannot wait for the next time! Husband grew up going on ski trips with his family and friends, so he is a fantastic skier. He picked right back up where he left off and was feeling pretty sore after the first day going down blacks. He was super sweet and went skiing with me a couple of times and was super patient while coaching me down the mountains. Love him. When we weren’t on the mountain shredding powder ;) we were hanging with our kiddos. We got to experience authentic dog sledding which was an interesting adventure. It was like a blizzard that day and the kiddos were freezing, so just getting them into the sled was a complete sh*t show. Everyone was staring at us like, get your kids under control and wipe the snot please. But once the doggies started running and as long as they were at full speed, my boys were silent and enjoyed the moment and scenery. It was so beautiful. I don’t think I will ever need to go dog sledding ever again, but at least I can check that off the bucket list. Another day was spent traveling over to West Yellowstone where we actually got to drive through the outer side of the national park (gorgeous, would love to go back in the summer) and visited the Grizzly & Wolf Discovery Center. The boys loved it! The wolves were stunning and so interactive. We only saw one bear and he seemed a bit old… but still entertaining for a few minutes while he moved logs around and ate. Highly recommend if you are visiting the area with small children, it’s nothing fancy but it was interesting. Most of all, what made the trip so fun was going with some of our great friends and their kiddos. We spent many nights making dinner at home, warming up in the hot tub, and cuddling up enjoying the log burning fireplace with a nice glass of wine. We had a great time and hope to visit again real soon! My 35th year on this beautiful planet started in one of my favorite places. California, and Malibu in particular, hold such a special place in my heart. I lived there for 5 years, went to college there, made some amazing friends that are like family to me there, and have experienced some pretty incredible things that most people only dream about. I’m very fortunate that my parents sacrificed so much to allow me these opportunities, and it helped mold me into the person I am today. In 2018, I was so fortunate to be able to travel to California not once, not twice, but THREE times! The first we went to visit my very best friend and celebrate her daughter’s first birthday at Disneyland. I don’t think I posted about this trip because it was a quick weekend, I didn’t get many pictures, and to be honest… it was EXHAUSTING traveling with two toddlers by myself. Not sure what I was thinking… The second trip was in October where Husband & I went with three other couple friends to Napa for a few days of wine drunk hilarity, again, I don’t think I posted about that trip… read: wine drunk hangover. But this trip, this amazing birthday trip, I got to go with my sweet little family (plus our nanny :)) and enjoy the good life for a few days. Got to do all the cool stuff like stay at one of my FAVORITE hotels (Shutters on the Beach), hang at the beaches and parks, and visited my alma mater, had brunch with my sister cousin and sweet baby Parker James… then, when husband & I wanted to have a nice dinner or go shopping without being interrupted by a massive meltdown, the kiddos went back to the hotel and hung with the sitter! It.Was.AWESOME! There are not enough words to express how amazing he is to me. He truly exemplifies what it means to be a husband and father and I couldn’t have been blessed with a better partner in life. He really outdid himself this year, and I’m so lucky. So. Very. Lucky. Thank you, hunny, for always treating me like a queen. I love you.